Best pudding cake! 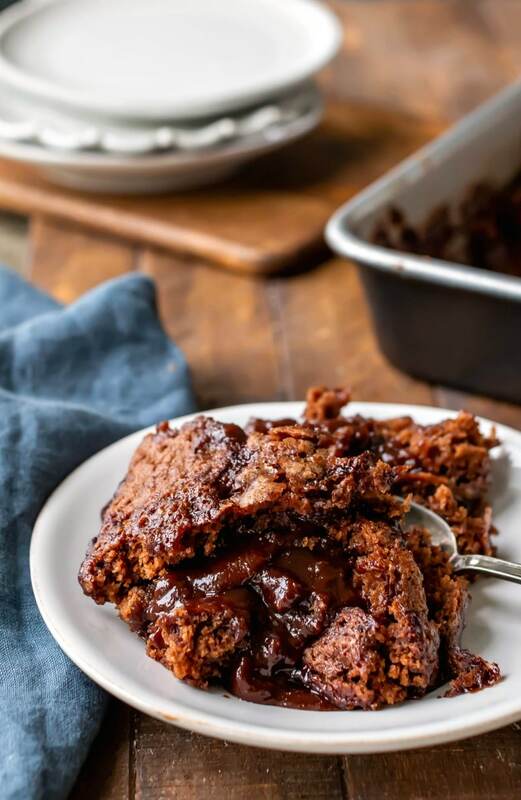 This easy hot fudge pudding cake recipe makes a delicious chocolate cake and hot fudge topping all in one pan. Published 10/3/12. Updated with new photos and tips 10/10/18. Chocolate pudding cake was one of the first cakes that I learned to bake. The recipe was in my junior cookbook, and I thought it was magical the way that the cake came out with a warm chocolate layer covering the moist chocolate cake. 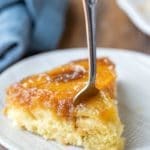 This is a newer recipe, but this cake is still one of my favorites. It’s total comfort food that’s perfect for a cool fall night. Plus, it’s incredibly easy to make! There are only a couple places where you can go wrong. First, don’t stir the water in! 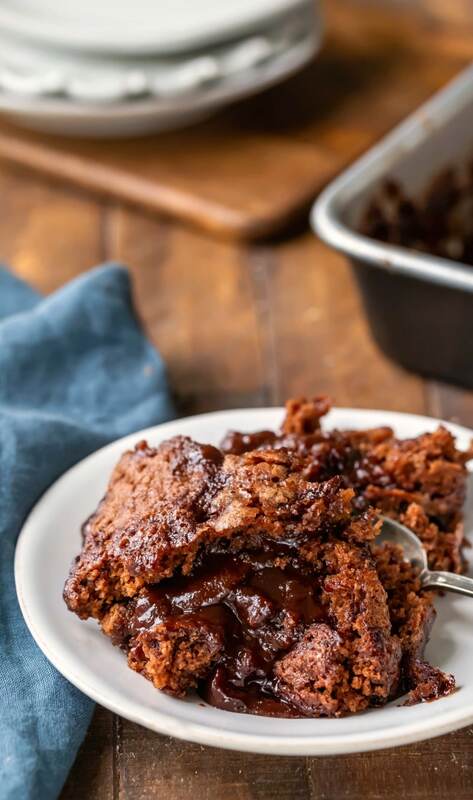 The water combines with the topping to form the hot fudge sauce, and there’s no need to stir it in. Second, you won’t want to overbake the cake. It should look like a layer of hot fudge is bubbling underneath the cooked cake layer. 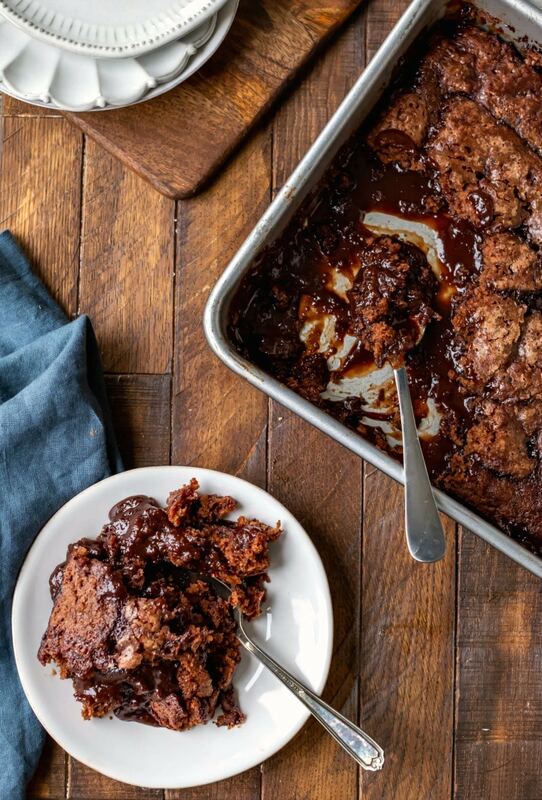 If you overbake it, you’ll lose some of the fudgy sauce. I like the pudding cake all on its own. However, if you’re a cake and ice cream kinda person, this is the perfect cake to serve with a scoop (or two) of vanilla ice cream. 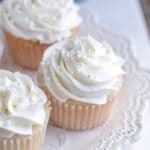 It’s also delicious with some sweetened whipped cream. 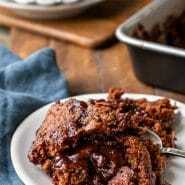 If you like this recipe, try these pudding cakes! 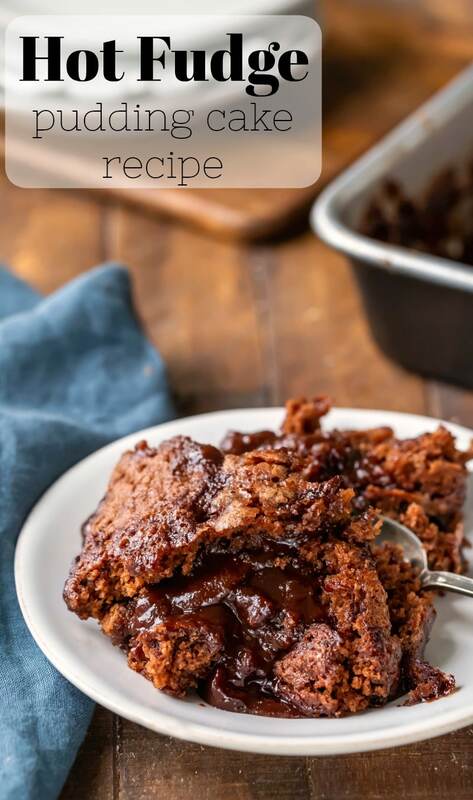 If you’ve tried this hot fudge pudding cake recipe, don’t forget to rate the recipe and leave me a comment below. I love to hear from people who’ve made my recipes! You can SUBSCRIBE to receive my latest recipe newsletters or FOLLOW ME on FACEBOOK, INSTAGRAM and PINTEREST for even more delicious food. Preheat the oven to 350 F. Grease a 9-inch square baking dish. Set aside. For the cake, whisk together the flour, sugar, cocoa, baking powder, and salt in a bowl. Whisk in the milk, butter, and vanilla. For the topping, whisk together the sugars and cocoa; sprinkle it evenly over the batter. Pour the hot water over the top. Do not stir the water in. 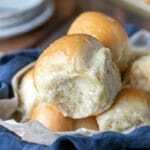 Bake 25-30 minutes. It should look like a thin layer of baked brownie with fudge bubbling up in spots. Take out of the oven, and let stand 15 minutes. *It's important not to overcook the cake. If you do, you won't get as much of the hot fudge sauce. Made this and ate a fourth of it when it came out of the oven. So good! Brings back memories of having this type a cake when I was a kid. I’m so glad! I love how food can bring back memories. =) Thanks for commenting! Great cake! The cake was easy and we loved the chocolate sauce. Thanks! Hi Kate just wandering if C is for Cup then T is it for Table Spoon?